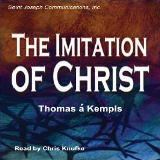 In this all-new digital recording, the saintly Thomas à Kempis speaks to true Christian souls of all generations, reminding them of the shortness of time and the length of eternity. For almost six hundred years this timeless work has been a powerful tool for the sanctification of countless Catholic souls. Since its publication in 1418, The Imitation of Christ has been second in popularity only to the Holy Bible with Catholics and Christians of all creeds. Order now.